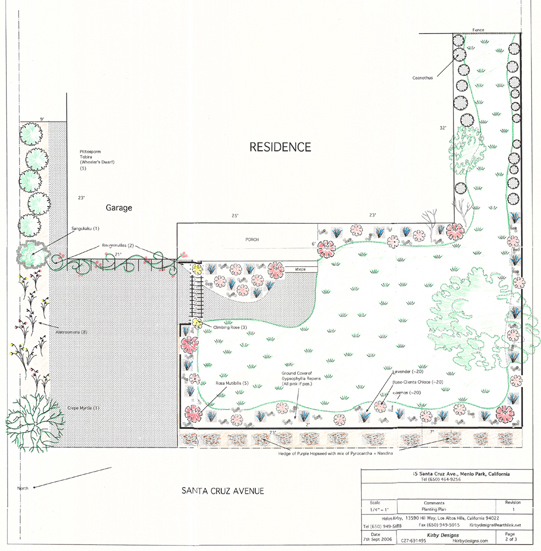 Please send the following information to help me design your new garden. A sketch as informal as the following is quite acceptable. 2) Second, tell me the features you definitely want in your garden, e.g., the biggest lawn posible, a fountain, a gazebo, an apple tree. Maybe you want it to look "English," or "Mediterranian," to attract butterflies, or to include a rose garden or a pond. If you haven't the foggiest idea, that's OK too - that's why we have landscape designers! Give me a general overview of the site, e.g. this is a very sunny garden, this is a very shady garden due to next door's tall trees, we have a strong wind blowing off the sea, we live in the desert, or the water table is 3" below the surface! Send me these details the same way you choose to send the rough sketch. KIRBY DESIGNS, PO box 1114, Los Altos, California 94023. Do make sure to include your name and address! An even more convenient way of doing this is to buy one of those $5 "throw away" cameras from the supermarket, shoot all of the photos and mail the camera to me, I will develop the pictures. Please do not fax the photos - they just end up black and white smudges. 4) Last, fill out the form on the next page. As soon as I have recieved your sketch, the photos, the information about the job site and your fee, I will start your design. Typically, I should get your drawings to Fed-Ex within two weeks, I will e-mail tracking numbers etc. on day of mailing. For an extra charge I would be happy to include a low voltage lighting plan. For a further charge I will design an irrigation plan to fit your planting plan (you will have to measure your water pressure (typically ~60psi) and tell me the size of your water meter so that I can know the "flow" (gpm) - your meter size is usually on your water bill). In addition to the coloured drawing such as the one below, I will include two black and white copies of same (i.e. ones you can give to your contractor or take to the nursery) and a detailed planting list in Excel format. The planting list includes a picture of the plant, the plant's common name, scientific name, color of bloom, when it blooms, light conditions (sun/semi/shade), number of these plants, capacity (1gal, 6-pack etc) and a space for your local nursery to fill in the unit price of each plant to enable you to get a fast estimate. Sometimes the nursery will accept a fax or e-mail of these plant lists, which makes estimates super easy. I can e-mail this list if you wish so that you can enter the nursery's prices, Excel then does the arithmetic, totals the final column, and you get a grand total of cost of plants. 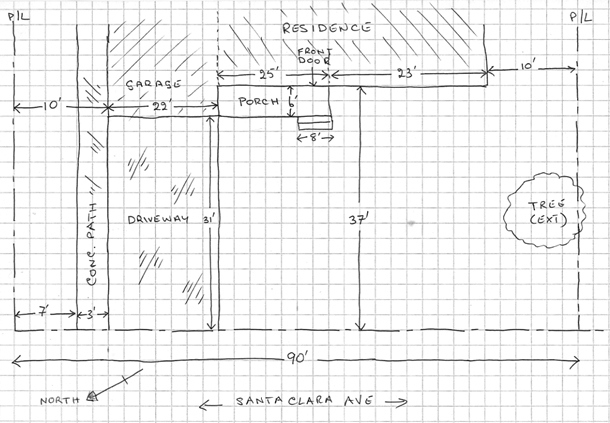 The hardscape section of my lists calculate surface areas of patios, decks, soil, and volume of concrete where applicable. Don't forget the rules though, each contractor has to make his own physical measurements on site. Those are not my rules by the way, it's just how it has to be. My calculations will be a verification for him and enable you to make an estimate of the cost of your project before you call in the contractor, it will also speed up your estimate.